Pretty as a picture…or a painting! August, 2014 – Sun Valley, Idaho, the “ski resort town,” has an artsy soul, and this is especially evident in the summertime. While happily camped in the Sawtooth National Recreation Area, we got on our mountain bikes one morning and began roaming around the dirt roads through the woods. All of a sudden we came across an artist set up with oil paints and a palette, creating a painting on an easel. 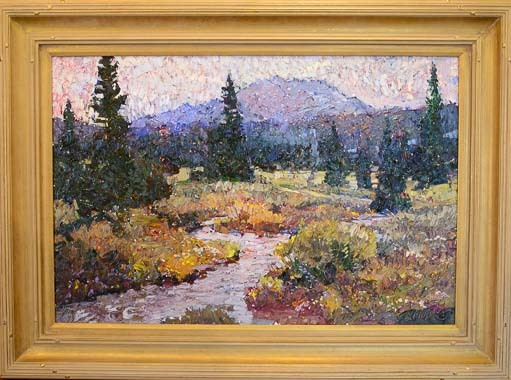 Bart Walker brings the landscape alive on his canvas. What a great place to paint! 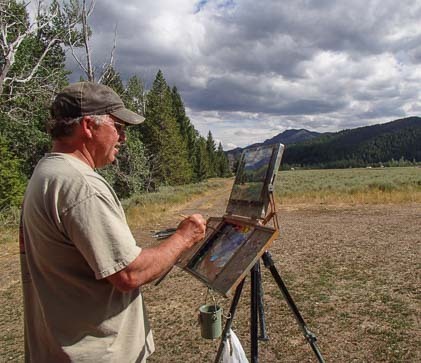 The artist introduced himself as Bart Walker, and we watched him quickly bringing the bucolic scenery around us to life on his canvas. 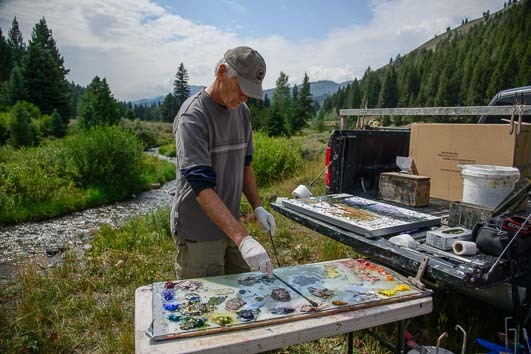 It turned out that he was making paintings for the upcoming “Plein Air” art exhibition held at the Kneeland Gallery in town in a few weeks. 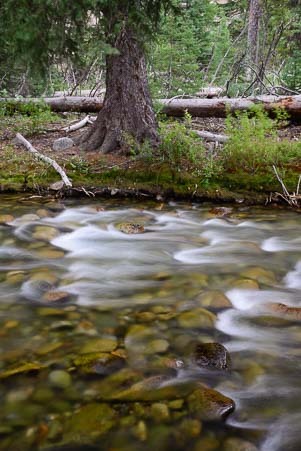 Even though he is from Wyoming’s Teton Mountains area, he knows the Sawtooths well, and he suggested we go to a spot down on the Big Wood River where we might get some good photos. We promptly followed his suggestion and had loads of fun on the riverbanks getting artsy shots with creamy water. 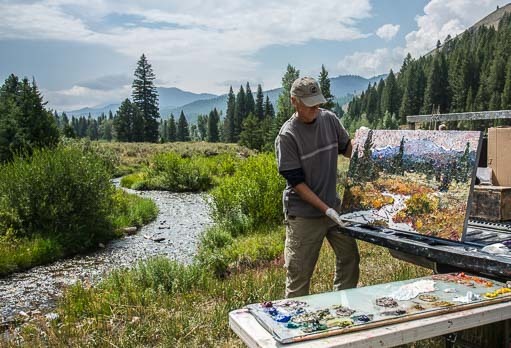 When the appointed weekend for the art exhibition came, we found ourselves surrounded by plein air artists in the woods recreating the stunning landscapes of the Sawtooth mountains. We wandered from one easel to the next, intrigued by how differently each artist interpreted their natural surroundings. We loved being surrounded by these artists out in nature. 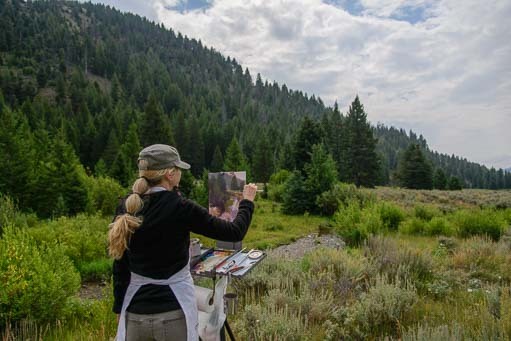 We discovered later that the 10 or so artists that are invited to show their work at the Kneeland Gallery’s Plein Air art exhibition each summer are all very accomplished and well known artists. We were watching true pros painting around us in the woods, folks who make their living from their art! A whole group of knowledgeable admirers were also roaming from one canvas to the next, and we fell right in step with them, getting the low down, in whispers, on who was who and who did what kind of art. Some of the artists were staying in their campers. Robert Moore’s unique style of painting is almost performance art! I looked aver at a guy with a huge palette of paints and a canvas spread out on the tailgate of a pickup truck. “He’s color blind,” the guy went on. What?! I had to learn more. Robert was extremely friendly and unassuming, and as we talked, he painted in brisk strokes with two brushes, one held in each hand. Robert shows me his unfinished painting. He even dipped his rubber gloved fingers in the paints and squished them around on the canvas, like a kid finger painting! “I can’t distinguish between greens and oranges,” he explained to me, gesturing to those colors on the palette. “My assistant, Silas, helps me by arranging the colors on the palette so I know where each one is.” He worked very fast and with great self-assurance. At the beginning, when the canvas was blank, he had started by squeezing paint from the tubes directly on the canvas. Finished, framed, and on the wall at Kneeland Gallery in Ketchum. The lines of paint were still there, and as his brushes reached them, they blended the colors. Yet each brush stroke visibly retained all the colors that were in the mixture. Miraculously, a beautiful painting of a stream was emerging. He held the painting up for me. Wow! Families picnic and listen to beautiful music. The next evening we went to the gallery open house. Little did we know that every Friday night in Sun Valley there is an Art Walk where all the galleries (and there are lots of them) open their doors and pour generous glasses of free wine for visitors. With an increasingly wobbly gate, patrons and admirers of the arts wander from gallery to gallery, taking in beautiful works of modern impressionism, fine art photography, modern art, sculpture and more. After a few glasses of wine, even the most stark modern art makes total sense! 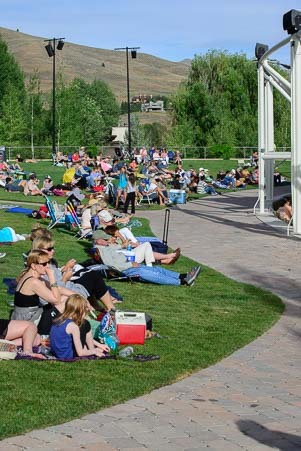 Sun Valley is also famous for its outstanding free summer symphony concert series. 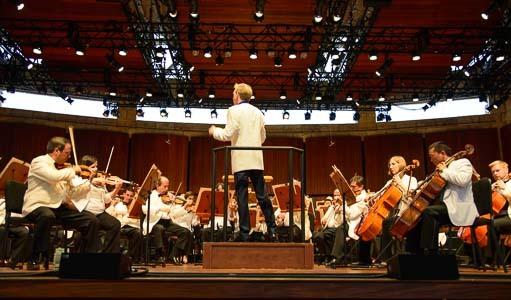 The Sun Valley Pavilion is a beautiful home for the symphony orchestra. 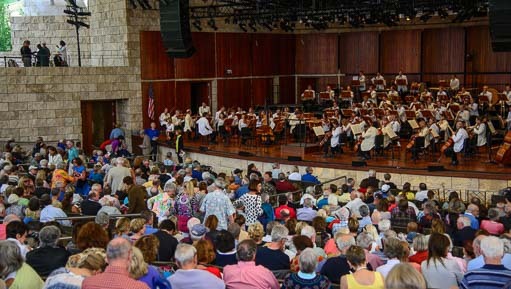 For three and a half weeks, the Sun Valley Pavilion comes alive almost every night with music played by the top notch Sun Valley Symphony. We are treated to a night of Brahms — sheer joy for me! Outside the Pavilion, families and friends enjoy picnics on the lawn where the music is played over mammoth speakers. Inside, there is loads of free theater seating that is all first come first serve. The Pavilion is a tens-of-millions-of-dollars architectural marvel and was a gift to the community from the owner of Sun Valley Resort. While waiting for Mark to get a beer, I happened to rest my hip on a low interior stone wall. An usher came over to me and said politely that I shouldn’t sit on the wall. Don’t sit on the walls…this rock is special! Slightly affronted, because I had been leaning on the wall, not sitting on it, I decided to joke a bit with him. 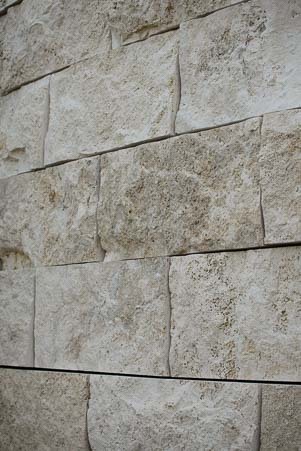 “Is there something special about this rock wall?” I asked, laughing. I sprang away from the wall and then gingerly reached back and touched it in amazement. 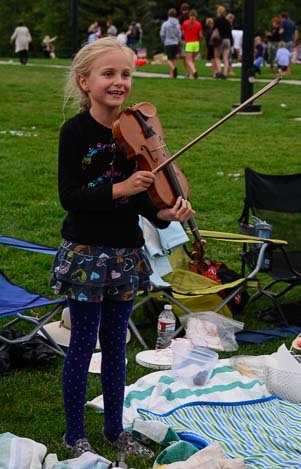 After the concert was over, a little girl stood up amid her family’s picnic blanket and chairs and began an impromptu violin concert of her own, singing and playing some country tunes. A small crowd gathered around her, and her smile got bigger and bigger as she performed for a rapt audience. 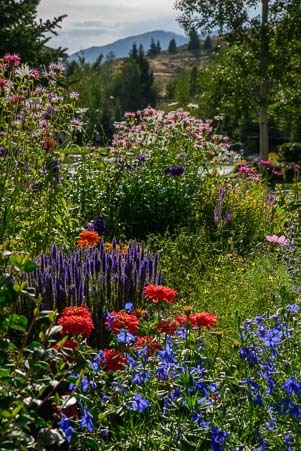 And that’s the way life is in Sun Valley, Idaho, where mega wealth and majestic natural beauty come together to make a playground for everyone that is full of fine art, exquisite music and outdoor fun. Best of all, most of it can be enjoyed for free! A sunrise worth leaping out of bed for! Sun Valley Symphony free summer concert series. New to this site? Visit our Home page to read more about our full-time traveling lifestyle and find out where we keep all the good stuff. If you like what you see, we'd love for you to subscribe to receive our latest posts! 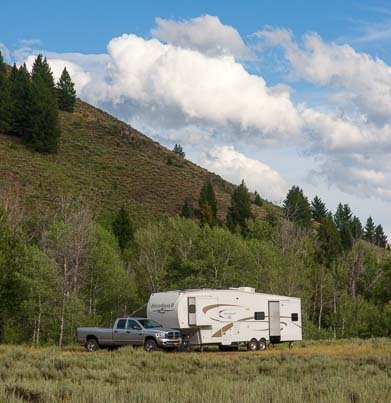 This entry was posted in Idaho and tagged Idaho, New, Small Towns, Sun Valley Area, Travel, USA, WP Travel by Roads Less Traveled. Bookmark the permalink. Our first solar charge controller was a Morningstar 10 amp (left). Now we have an Outback 60 amp (right). To learn more about these charge controllers, visit SMALL Solar Power or BIG Solar Power depending on how much you want too boondock! NOW is the time to buy a camera. The Nikon D3300 (left) is a FANTASTIC starter DSLR and I use the Olympus Tough (right) for hiking/biking/snorkeling. More camera tips here: Camera Gear & Tips.